For the actor, see Glen Gould. Gould in later years and, beneath, his signature. Glenn Herbert Gould[fn 1][fn 2] (/ɡuːld/; 25 September 1932 – 4 October 1982) was a Canadian pianist who became one of the best-known and most-celebrated classical pianists of the 20th century. He was renowned as an interpreter of the keyboard works of Johann Sebastian Bach. Gould's playing was distinguished by a remarkable technical proficiency and a capacity to articulate the polyphonic texture of Bach's music. Gould rejected most of the standard Romantic piano literature by Chopin, Liszt, and others, in favor of Baroque, Renaissance, late-Romantic, and modernist composers. Although his recordings were dominated by Bach and Beethoven, Gould's repertoire was diverse, including works by Mozart, Haydn, Brahms, pre-Baroque composers such as Jan Pieterszoon Sweelinck, Orlando Gibbons and William Byrd, and such 20th-century composers as Paul Hindemith, Arnold Schoenberg, and Richard Strauss. Gould was known for his eccentricities, from his unorthodox musical interpretations and mannerisms at the keyboard, to aspects of his lifestyle and behaviour. He stopped giving concerts at the age of 31 to concentrate on studio recording and other projects. Gould was also a writer, broadcaster, and conductor. He was a prolific contributor to musical journals, in which he discussed music theory and outlined his musical philosophy. He performed on television and radio, and produced three musique concrète radio documentaries called the Solitude Trilogy, about isolated areas of Canada. Glenn Herbert Gould was born at home (32 Southwood Drive) in Toronto, on 25 September 1932, to Russell Herbert Gold (1901–1996) and Florence Emma Gold (née Grieg; 1891–1975), Presbyterians of Scottish and English ancestry. His maternal grandfather was a cousin of the Norwegian composer Edvard Grieg (who was himself of Scottish ancestry). The family's surname was changed to Gould informally around 1939 in order to avoid being mistaken for Jewish, given the prevailing anti-Semitism of pre-war Toronto and the Jewish associations of the Gold surname. [fn 3] Gould had no Jewish ancestry,[fn 4] though he sometimes made jokes on the subject, such as "When people ask me if I'm Jewish, I always tell them that I was Jewish during the war." His childhood home has been named a historic site by the City of Toronto. Gould's interest in music and his talent as a pianist were evident very early. Both his parents were musical, and his mother, especially, encouraged the infant Gould's early musical development. His mother, hoping for him to become a successful musician, had exposed him to music during her pregnancy. She would later teach him the piano. As a baby, he reportedly hummed instead of crying and wiggled his fingers as if playing chords, leading his doctor to predict that he would "be either a physician or a pianist". He learned to read music before he could read words, and it had been observed that, at age three, he had perfect pitch. When presented with a piano, the young Gould was reported to strike single notes and listen to their long decay, a practice his father Bert noted was different from typical children. Gould's interest in the piano was concomitant with an interest in composition. He would play his own little pieces for family, friends, and sometimes large gatherings—including, in 1938, a performance at the Emmanuel Presbyterian Church (a few blocks from the Gould family home) of one of his own compositions. It was Hofmann. It was, I think, his last performance in Toronto, and it was a staggering impression. The only thing I can really remember is that, when I was being brought home in a car, I was in that wonderful state of half-awakeness in which you hear all sorts of incredible sounds going through your mind. They were all orchestral sounds, but I was playing them all, and suddenly I was Hofmann. I was enchanted. Gould with his teacher, Alberto Guerrero, at the Royal Conservatory of Music in Toronto, in 1945. Guerrero demonstrated his technical idea that Gould should "pull down" at the keys instead of striking them from above. At the age of 10, he began attending the Royal Conservatory of Music in Toronto (known until 1947 as the Toronto Conservatory of Music). He studied music theory with Leo Smith, the organ with Frederick C. Silvester, and piano with Alberto Guerrero. Around the same time, he injured his back as a result of a fall from a boat ramp on the shore of Lake Simcoe. [fn 5] This incident is almost certainly related to the adjustable-height chair his father made shortly thereafter. Gould's mother would urge the young Gould to sit up straight at the keyboard. He used this famous chair for the rest of his life and took it with him almost everywhere. The chair was designed so that Gould could sit very low at the keyboard, and allowed him to pull down on the keys rather than striking them from above, a central technical idea of his teacher at the Conservatory, Alberto Guerrero. Gould developed a technique that enabled him to choose a very fast tempo while retaining the "separateness" and clarity of each note. His extremely low position at the instrument permitted him more control over the keyboard. Gould showed considerable technical skill in performing and recording a wide repertoire including virtuosic and romantic works, such as his own arrangement of Ravel's La valse, and Liszt's transcriptions of Beethoven's Fifth and Sixth Symphonies. Gould worked from a young age with Guerrero on a technique known as finger-tapping: a method of training the fingers to act more independently from the arm. He stated that he did not understand the requirement of other pianists to continuously reinforce their relationship with the instrument by practicing many hours a day. It seems that Gould was able to practice mentally without access to an instrument, once going so far as to prepare for a recording of Brahms' piano works without playing them until only a few weeks before the sessions. Gould could play from memory not just a vast repertoire of piano music, but also a wide range of orchestral and operatic transcriptions. He could "memorize at sight" and once challenged his friend John Roberts to name any piece of music that he could not "instantly play from memory". The piano, Gould said, "is not an instrument for which I have any great love as such... [but] I have played it all my life, and it is the best vehicle I have to express my ideas." In the case of Bach, Gould noted, "[I] fixed the action in some of the instruments I play on—and the piano I use for all recordings is now so fixed—so that it is a shallower and more responsive action than the standard. It tends to have a mechanism which is rather like an automobile without power steering: you are in control and not it; it doesn't drive you, you drive it. This is the secret of doing Bach on the piano at all. You must have that immediacy of response, that control over fine definitions of things." As a teenager, Gould was significantly influenced by Artur Schnabel,[fn 10] Rosalyn Tureck's recordings of Bach (which he called "upright, with a sense of repose and positiveness"), and the conductor Leopold Stokowski. Gould was known for having a vivid imagination. Listeners regarded his interpretations as ranging from brilliantly creative to outrightly eccentric. His pianism had great clarity and erudition, particularly in contrapuntal passages, and extraordinary control. Gould believed the piano to be "a contrapuntal instrument," and his whole approach to music was, in fact, centered in the baroque. Much of the homophony that followed he felt belongs to a less serious and less spiritual period of art. Gould had a pronounced aversion to what he termed "hedonistic" approaches to piano repertoire, performance, and music generally. For Gould, "hedonism" in this sense denoted a superficial theatricality, something to which he felt Mozart, for example, became increasingly susceptible later in his career. He associated this drift towards hedonism with the emergence of a cult of showmanship and gratuitous virtuosity on the concert platform in the 19th century and later. The institution of the public concert, he felt, degenerated into the "blood sport" with which he struggled, and which he ultimately rejected. On 5 June 1938, at the age of five, Gould played in public for the first time, joining his family on stage to play piano at a church service at the Business Men's Bible Class in Uxbridge, Ontario, in front of a congregation of about two thousand. In 1945, at the age of thirteen, he made his first appearance with an orchestra in a performance of the first movement of Beethoven's 4th Piano Concerto with the Toronto Symphony. His first solo recital followed in 1947, and his first recital on radio was with the CBC in 1950. This was the beginning of Gould's long association with radio and recording. He founded the Festival Trio chamber group in 1953 with the cellist Isaac Mamott and the violinist Albert Pratz. In 1957, Gould undertook a tour of the Soviet Union, becoming the first North American to play there since World War II. His concerts featured Bach, Beethoven, and the serial music of Schoenberg and Berg, which had been suppressed in the Soviet Union during the era of Socialist Realism. Gould made his Boston debut in 1958, playing for the Peabody Mason Concert Series. On 31 January 1960, Gould made his American television debut on CBS's Ford Presents series, performing Bach's Keyboard Concerto No. 1 in D minor (BWV 1052) with Leonard Bernstein conducting the New York Philharmonic. Gould was convinced that the institution of the public concert was not only an anachronism, but also a "force of evil", leading to his retirement from concert performance. He argued that public performance devolved into a sort of competition, with a non-empathetic audience (musically and otherwise) mostly attendant to the possibility of the performer erring or not meeting critical expectation. He set forth this doctrine, only half in jest, in "GPAADAK", the Gould Plan for the Abolition of Applause and Demonstrations of All Kinds. On 10 April 1964, Gould gave his last public performance, playing in Los Angeles, at the Wilshire Ebell Theater. Among the pieces he performed that night were Beethoven's Piano Sonata No. 30, selections from Bach's The Art of Fugue, and Paul Hindemith's Piano Sonata No. 3. [fn 11] Gould performed fewer than 200 concerts over the course of his career, of which fewer than 40 were outside Canada. For a pianist such as Van Cliburn, 200 concerts would have amounted to about two years' touring. One of Gould's reasons for abandoning live performance was his aesthetic preference for the recording studio, where, in his words, he developed a "love affair with the microphone". [fn 12] There, he could control every aspect of the final musical "product" by selecting parts of various takes. He felt that he could realize a musical score more fully this way. Thus, the act of musical composition, to Gould, did not entirely end with the original score. The performer had to make creative choices. Gould felt strongly that there was little point in re-recording centuries-old pieces if the performer had no new perspective to bring to the work. For the rest of his life, Gould eschewed live performance, focusing instead on recording, writing, and broadcasting. Gould was widely known for his unusual habits. He often hummed or sang while he played, and his audio engineers were not always successful in excluding his voice from recordings. Gould claimed that his singing was unconscious and increased in proportion to his inability to produce his intended interpretation from a given piano. It is likely that this habit originated in his having been taught by his mother to "sing everything that he played", as his biographer Kevin Bazzana puts it. This became "an unbreakable (and notorious) habit". Some of Gould's recordings were severely criticised because of this background "vocalising". For example, a reviewer of his 1981 re-recording of the Goldberg Variations opined that many listeners would "find the groans and croons intolerable". Gould was renowned for his peculiar body movements while playing and for his insistence on absolute control over every aspect of his environment. The temperature of the recording studio had to be precisely regulated. He invariably insisted that it had to be extremely warm. According to another of Gould's biographers, Otto Friedrich, the air-conditioning engineer had to work just as hard as the recording engineers. The piano had to be set at a certain height and would be raised on wooden blocks if necessary. A small rug would sometimes be required for his feet underneath the piano. He had to sit exactly fourteen inches above the floor, and would play concerts only while sitting on the old chair his father had made. He continued to use this chair even when the seat was completely worn through. His chair is so closely identified with him that it is shown in a place of honour in a glass case at the National Library of Canada. Conductors had mixed responses to Gould and his playing habits. George Szell, who led Gould in 1957 with the Cleveland Orchestra, remarked to his assistant, "That nut's a genius." Leonard Bernstein said, "There is nobody quite like him, and I just love playing with him." Bernstein created a stir at the concert of April 6, 1962 when, just before the New York Philharmonic was to perform the Brahms Piano Concerto No. 1 in D minor with Gould as soloist, he informed the audience that he was assuming no responsibility for what they were about to hear. He asked the audience: "In a concerto, who is the boss – the soloist or the conductor? ", to which the audience laughed. "The answer is, of course, sometimes the one and sometimes the other, depending on the people involved." Specifically, Bernstein was referring to their rehearsals, with Gould's insistence that the entire first movement be played at half the indicated tempo. The speech was interpreted by Harold C. Schonberg, music critic for The New York Times, as an abdication of responsibility and an attack on Gould. Plans for a studio recording of the performance came to nothing. The live radio broadcast was subsequently released on CD, Bernstein's disclaimer included. Gould was averse to the cold, and wore heavy clothing (including gloves), even in warm places. He was once arrested, having possibly been mistaken for a vagrant, while sitting on a park bench in Sarasota, Florida, dressed in his standard all-climate attire of coats, hat and mittens. He also disliked social functions. He hated being touched, and in later life limited personal contact, relying on the telephone and letters for communication. On a visit to Steinway Hall in New York City in 1959, Gould was greeted by the chief piano technician at the time, William Hupfer, with a slap on the back. Gould was shocked by this, and complained of aching, lack of coordination, and fatigue because of the incident. He went on to explore the possibility of litigation against Steinway & Sons if his apparent injuries were permanent. He was known for cancelling performances at the last minute, which is why Bernstein's aforementioned public disclaimer opened with, "Don't be frightened, Mr. Gould is here... [he] will appear in a moment." In his liner notes and broadcasts, Gould created more than two dozen alter egos for satirical, humorous, and didactic purposes, permitting him to write hostile reviews or incomprehensible commentaries on his own performances. Probably the best-known are the German musicologist "Karlheinz Klopweisser", the English conductor "Sir Nigel Twitt-Thornwaite", and the American critic "Theodore Slutz". These facets of Gould, whether interpreted as neurosis or "play", have provided ample material for psychobiography. Fran's Restaurant in Toronto was a regular haunt of Gould's. A CBC profile noted, "sometime between two and three every morning, Gould would go to Fran's, a 24-hour diner a block away from his Toronto apartment, sit in the same booth, and order the same meal of scrambled eggs." In a letter to the cellist Virginia Katims of 20 January 1973, Gould said he had been vegetarian for about ten years. Gould lived a private life. The documentary filmmaker Bruno Monsaingeon said of him, "No supreme pianist has ever given of his heart and mind so overwhelmingly while showing himself so sparingly." He never married, and biographers have spent considerable time on his sexuality. Bazzana writes that "it is tempting to assume that Gould was asexual, an image that certainly fits his aesthetic and the persona he sought to convey, and one can read the whole Gould literature and be convinced that he died a virgin"—but he also mentions that evidence points to "a number of relationships with women that may or may not have been platonic and ultimately became complicated and were ended". One piece of evidence arrived in 2007. When Gould was in Los Angeles in 1956, he met Cornelia Foss, an art instructor, and her husband Lukas, a conductor. After several years, Gould and she became lovers. She left her husband in 1967 for Gould, taking her two children with her to Toronto. She purchased a house near Gould's 110 St. Clair Avenue West apartment. In 2007, Foss confirmed that she and Gould had had a love affair lasting several years. According to Foss, "There were a lot of misconceptions about Glenn, and it was partly because he was so very private. But I assure you, he was an extremely heterosexual man. Our relationship was, among other things, quite sexual." Their affair lasted until 1972, when she returned to her husband. As early as two weeks after leaving her husband, Foss noticed disturbing signs in Gould, alluding to unusual behaviour that was more than "just neurotic". Specifically he believed that "someone was spying on him", according to Foss's son. Though he was an admitted hypochondriac,[fn 13] Gould suffered many pains and ailments; his autopsy, however, revealed few underlying problems in areas that often troubled him. [fn 14] He was highly concerned about his health throughout his life, worrying about everything from high blood pressure (which in his later years he recorded in diary form) to the safety of his hands. (Gould rarely shook people's hands, and habitually wore gloves. )[fn 15][fn 16] The spine injury he had suffered early in life led to physicians prescribing, usually independently, an assortment of analgesics, anxiolytics, and other drugs. Bazzana has speculated that Gould's increasing use of a variety of prescription medicines over his career may have had a deleterious effect on his health. It had reached the stage, Bazzana writes, that "he was taking pills to counteract the side effects of other pills, creating a cycle of dependency". According to Peter Goddard, in 1955, Gould said, "my hysteria about eating...it's getting worse all the time." In 1956, he was also taking Thorazine, an anti-psychotic medication, as well as reserpine, another anti-psychotic, but one that can also be used to lower blood pressure. Cornelia Foss has said that Gould took a lot of antidepressants, which she blamed for his deteriorating mental state. Whether Gould's behaviour fell within the autism spectrum has been the subject of debate. The diagnosis was first suggested by psychiatrist Peter Ostwald, a friend of Gould's, in the 1997 book Glenn Gould: The Ecstasy and Tragedy of Genius. There has also been speculation that he may have had bipolar disorder, because he sometimes went several days without sleep, had extreme increases in energy, drove recklessly, and, in later life, endured deep depressive episodes. On 27 September 1982, two days after his 50th birthday, after experiencing a severe headache, Gould suffered a stroke that paralyzed the left side of his body. He was admitted to Toronto General Hospital, and his condition rapidly deteriorated. By 4 October, there was evidence of brain damage, and Gould's father decided that his son should be taken off life support. Gould's public funeral was held in St. Paul's Anglican Church on 15 October with singing by Lois Marshall and Maureen Forrester. The service was attended by over 3,000 people, and was broadcast on the CBC. He is buried next to his parents in Toronto's Mount Pleasant Cemetery (section 38, row 1088, plot 1050). The first few bars of the Goldberg Variations are carved on his grave marker. Gould, an unabashed animal-lover, left half his estate to the Humane Society in Toronto; the other half went to the Salvation Army. Gould is reported to have "periodically told interviewers that if he had not been a pianist, he would have been a writer". He expounded his criticism and philosophy of music and art in lectures, convocation speeches, periodicals, and in radio and television documentaries for the CBC. Gould participated in many interviews, and had a predilection for scripting them to the extent that they may be seen to be as much off-the-cuff discussions as they are works proper. Gould's writing style was highly articulate, but sometimes florid, indulgent, and rhetorical. This is especially evident in his (frequent) attempts at humour and irony. [fn 17] Bazzana writes that although some of Gould's "conversational dazzle" found its way into his prolific written output, his writing was "at best uneven [and] at worst awful". While offering "brilliant insights" and "provocative theses", Gould's writing is often marred by "long, tortuous sentences" and a "false formality", Bazzana writes. In his writing, Gould praised certain composers and rejected what he deemed banal in music composition and its consumption by the public, and also gave analyses of the music of Richard Strauss, Alban Berg and Anton Webern. Despite a certain affection for Dixieland jazz, Gould was mostly averse to popular music. He enjoyed a jazz concert with his friends as a youth, mentioned jazz in his writings, and once criticized the Beatles for "bad voice leading"[fn 18]—while praising Petula Clark and Barbra Streisand. Gould and jazz pianist Bill Evans were mutual admirers, and Evans made his seminal record Conversations with Myself using Gould's celebrated Steinway model CD 318 piano. Gould's perspective on art is often summed up by this 1962 quote: "The justification of art is the internal combustion it ignites in the hearts of men and not its shallow, externalized, public manifestations. The purpose of art is not the release of a momentary ejection of adrenaline but is, rather, the gradual, lifelong construction of a state of wonder and serenity." He was progressive and anti-progressive at once, and likewise at once both a critic of the Zeitgeist and its most interesting expression. He was, in effect, stranded on a beachhead of his own thinking between past and future. That he was not able, by himself, to fashion a bridge between them is neither surprising, nor, in the end, disappointing. We should see this failure, rather, as an aspect of his genius. He both was and was not a man of his time. The issue of "authenticity" in relation to an approach like Gould's has been a topic of great debate, although diminished by the end of the 20th century—a development that Gould seems to have anticipated. It asks whether a recording is less authentic or "direct" for having been highly refined by technical means in the studio. Gould likened his process to that of a film director—one does not perceive that a two-hour film was made in two hours—and implicitly asks why the act of listening to music should be any different. He went so far as to conduct an experiment with musicians, sound engineers, and laypeople in which they were to listen to a recording and determine where the splices occurred. Each group chose different points based on their relationship to music, but none was wholly successful. While the test was hardly scientific, Gould remarked, "The tape does lie, and nearly always gets away with it". In a lecture and essay titled "Forgery and Imitation in the Creative Process", one of Gould's most significant texts, he makes explicit his views on authenticity and creativity. Gould asks why the epoch in which a work is received influences its reception as "art", postulating a sonata of his own composition that sounds so like one of Haydn's that it is received as such. If, instead, the sonata had been attributed to an earlier or later composer, it becomes more or less interesting as a piece of music. Yet it is not the work that has changed but its relation within the accepted narrative of music history. Similarly, Gould notes the "pathetic duplicity" in the reception of high-quality forgeries by Han van Meegeren of new paintings attributed to the Dutch master Johannes Vermeer, before and after the forgery was known. Gould, therefore, prefers an ahistorical, or at least pre-Renaissance, view of art, minimizing the identity of the artist and the attendant historical context in evaluating the artwork: "What gives us the right to assume that in the work of art we must receive a direct communication with the historical attitudes of another period? ... moreover, what makes us assume that the situation of the man who wrote it accurately or faithfully reflects the situation of his time? ... What if the composer, as historian, is faulty?" The C major prelude from the first book of the WTC. Compare the 1970 version from the "Complete Piano Sonatas" set (played first) and the 1958 interpretation (second). The only organ recordings Gould made were the first nine parts of Bach's The Art of Fugue. Gould recorded several Handel suites and a few pieces from J.S. Bach's WTC on a Wittmayer harpsichord. The somewhat muffled sound of this 20th-century instrument is very different from modern recordings that are made using copies of old harpsichords. In creating music, Gould much preferred the control and intimacy provided by the recording studio. He disliked the concert hall, which he compared to a competitive sporting arena. He held his final public performance in 1964, and thereafter devoted his career to the studio, recording albums and several radio documentaries. He was attracted to the technical aspects of recording, and considered the manipulation of tape to be another part of the creative process. Although Gould's recording studio producers have testified that "he needed splicing less than most performers", Gould used the process to give himself total artistic control over the recording process. He recounted his recording of the A minor fugue from Book I of The Well-Tempered Clavier and how it was spliced together from two takes, with the fugue's expositions from one take and its episodes from another. Gould revered J.S. Bach, stating that the Baroque composer was "first and last an architect, a constructor of sound, and what makes him so inestimably valuable to us is that he was beyond a doubt the greatest architect of sound who ever lived". He recorded most of Bach's other keyboard works, including both books of The Well-Tempered Clavier and the Partitas, French Suites, English Suites, Inventions and Sinfonias, keyboard concertos, and a number of toccatas (which interested him least, being less polyphonic). For his only recording at the organ, he recorded about half of The Art of Fugue, which was also released posthumously on piano. As for Beethoven, Gould preferred the composer's early and late periods. He recorded all five of Beethoven's piano concertos, 23 of the 32 piano sonatas, and numerous bagatelles and variations. Gould was the first pianist to record any of Liszt's piano transcriptions of Beethoven's symphonies (beginning with the Fifth Symphony, in 1967, with the Sixth released in 1969). Gould also recorded works by Brahms, Mozart, and many other prominent piano composers, though he was outspoken in his criticism of the Romantic era as a whole. He was extremely critical of Frédéric Chopin. When asked in a radio interview if he did not find himself wanting to play Chopin, he replied: "No, I don't. I play it in a weak moment – maybe once a year or twice a year for myself. But it doesn't convince me." However, in 1970, he played the B minor sonata by Chopin for the CBC and stated that he liked some of the miniatures and that he "sort of liked the first movement of the B minor". Although he recorded all of Mozart's sonatas and admitted enjoying the "actual playing" of them, Gould claimed to dislike Mozart's later works, to the extent of arguing (perhaps facetiously) that Mozart died too late rather than too early. He was fond of a number of lesser-known composers such as Orlando Gibbons, whose Anthems he had heard as a teenager, and whose music he felt a "spiritual attachment" to. He recorded a number of Gibbons's keyboard works, and called him his favourite composer, despite his better-known admiration for the technical mastery of Bach. [fn 20] He made recordings of piano music by Jean Sibelius (the Sonatines and Kyllikki), Georges Bizet (the Variations Chromatiques de Concert and the Premier nocturne), Richard Strauss (the Piano Sonata, the Five Pieces, and Enoch Arden with Claude Rains), and Paul Hindemith (the three piano sonatas and the sonatas for brass and piano). He also made recordings of the complete piano works Lieder by Arnold Schoenberg. In early September 1982, Gould made his final recording: Strauss's Piano Sonata in B minor. The studio was incredibly overheated, which may be good for a pianist but not for a singer: a dry throat is the end as far as singing is concerned. But we persevered nonetheless. It wasn't easy for me. Gould began by improvising something Straussian—we thought he was simply warming up, but no, he continued to play like that throughout the actual recordings, as though Strauss's notes were just a pretext that allowed him to improvise freely. He worked with numerous vocalists to record Schoenberg, Hindemith, and Ernst Krenek, including Donald Gramm and Ellen Faull. Gould also recorded Bach's six sonatas for violin and harpsichord (BWV 1014–1019) with Jaime Laredo, and the three sonatas for viola da gamba and keyboard with Leonard Rose. Claude Rains narrated their recording of Strauss's Enoch Arden melodrama. Gould also collaborated with members of the New York Philharmonic, the flautist Julius Baker and the violinist Rafael Druian in a recording of Johann Sebastian Bach's Brandenburg Concerto No. 4 in G Major, BWV 1049. Gould made numerous television and radio programs for CBC Television and CBC Radio. Notable productions include his musique concrète Solitude Trilogy, which consists of The Idea of North, a meditation on Northern Canada and its people, The Latecomers, about Newfoundland, and The Quiet in the Land, about Mennonites in Manitoba. All three use a radiophonic electronic-music technique that Gould called "contrapuntal radio", in which several people are heard speaking at once—much like the voices in a fugue—manipulated through overdubbing and editing. Gould's experience of driving across northern Ontario while listening to Top 40 radio in 1967 provided the inspiration for one of his most unusual radio pieces, The Search for Petula Clark, a witty and eloquent dissertation on the recordings of the renowned British pop singer, who was then at the peak of her international success. He dabbled in composition with few finished works. As a teenager, Gould had written chamber music and piano works in the style of the Second Viennese school. His only significant work was a string quartet, which he finished when he was in his 20s (published 1956, recorded 1960), and perhaps his cadenzas to Beethoven's Piano Concerto No. 1. Later works include the Lieberson Madrigal (soprano, alto, tenor, bass [SATB] and piano), and So You Want to Write a Fugue? (SATB with piano or string-quartet accompaniment). His String Quartet (Op. 1) was met with mixed reaction: the Christian Science Monitor and Saturday Review were quite laudatory, while the Montreal Star was less so. There is little critical commentary on Gould's compositions for the simple reason that there are few of them; he never succeeded beyond Opus 1, and left a number of works unfinished. He attributed his failure as a composer to his lack of a "personal voice". The majority of his work is published by Schott Music. The recording Glenn Gould: The Composer contains his original works. Towards the end of his life, Gould began conducting. He had earlier directed Bach's Brandenburg Concerto No. 5 and the cantata Widerstehe doch der Sünde from the harpsipiano (a piano with metal hammers to simulate a harpsichord's sound), and Gustav Mahler's Symphony No. 2 (the Urlicht section) in the 1960s. His last recording as a conductor was of Wagner's Siegfried Idyll in its original chamber-music scoring. He intended to spend his later years conducting, writing about music, and composing. Gould is one of the most acclaimed musicians of the 20th century. His unique pianistic method, insight into the architecture of compositions, and relatively free interpretation of scores created performances and recordings that were revelatory to many listeners while being highly objectionable to others. Philosopher Mark Kingwell writes that "his influence is made inescapable. No performer after him can avoid the example he sets… Now, everyone must perform through him: he can be emulated or rejected, but he cannot be ignored." One of Gould's performances of the Prelude and Fugue in C major from Book II of The Well-Tempered Clavier was chosen for inclusion on the NASA Voyager Golden Record by a committee headed by Carl Sagan. The disc of recordings was placed on the spacecraft Voyager 1. On August 25, 2012, the spacecraft became the first to cross the heliopause and enter the interstellar medium. Gould is a popular subject of biography and even critical analysis. Philosophers such as Giorgio Agamben and Mark Kingwell have interpreted Gould's life and ideas. References to Gould and his work are plentiful in poetry, fiction, and the visual arts. François Girard's Genie Award winning 1993 film, Thirty Two Short Films About Glenn Gould includes documentary interviews with people who knew him, dramatizations of scenes from Gould's life, and fanciful segments including an animation set to music. Thomas Bernhard's renowned 1983 novel The Loser purports to be an extended first-person essay about Gould and his lifelong friendship with two fellow students from the Mozarteum school in Salzburg, both of whom have abandoned their careers as concert pianists due to the intimidating example of Gould's genius. Gould left an extensive body of work beyond the keyboard. After his retirement from concert performance, he was increasingly interested in other media, including audio and film documentary and writing, through which he mused on aesthetics, composition, music history, and the effect of the electronic age on the consumption of media. (Gould grew up in Toronto at the same time that Canadian theorists Marshall McLuhan, Northrop Frye, and Harold Innis were making their mark on communications studies.) Anthologies of Gould's writing and letters have been published, and Library and Archives Canada holds a significant portion of his papers. In 1983, Gould was posthumously inducted into the Canadian Music Hall of Fame. He was inducted into Canada's Walk of Fame in Toronto in 1998, and designated a National Historic Person in 2012. A federal plaque reflecting the designation was erected next to a sculpture of him in downtown Toronto. The Glenn Gould Studio at the Canadian Broadcasting Centre in Toronto was named after him. To commemorate what would have been Gould's 75th birthday, the Canadian Museum of Civilization held an exhibition titled Glenn Gould: The Sounds of Genius in 2007. The multimedia exhibit was held in conjunction with Library and Archives Canada. The Glenn Gould Foundation was established in Toronto in 1983 to honour Gould and to keep alive his memory and life's work. The foundation's mission "is to extend awareness of the legacy of Glenn Gould as an extraordinary musician, communicator, and Canadian, and to advance his visionary and innovative ideas into the future. ", and its prime activity is the awarding, triennially, of the Glenn Gould Prize to "an individual who has earned international recognition as the result of a highly exceptional contribution to music and its communication, through the use of any communications technologies." The prize consists of CA$100,000 for the recipient, and the responsibility of awarding the CA$15,000 Glenn Gould Protégé Prize to a young musician of their choice. The Royal Conservatory of Music Professional School in Toronto adopted the name The Glenn Gould School in 1997, after their most famous alumnus. Gould received many honours both during his lifetime (while claiming to despise competition in music) and posthumously. In 1970, the government of Canada offered him the Companion of the Order of Canada, but he declined, believing himself to be too young. The Juno Awards are presented annually by the Canadian Academy of Recording Arts and Sciences. Gould won three awards out of his six nominations, but accepted only one in person. The Grammys are awarded annually by the National Academy of Recording Arts and Sciences. Gould won four awards, but, as with the Junos, accepted only one in person. In 1983, he was honoured posthumously, being inducted into the Grammy Hall of Fame for his 1955 recording (released in 1956) of the Goldberg Variations. ^ Bazzana (2003, p. 27) states, "Gould's first name is frequently misspelled as 'Glen' in documents (including official ones) dating back to the beginning of his life, and Gould himself used both spellings interchangeably throughout his life." Bazzana (2003, p. 24)[who? ]Further investigated the name-change records in Ontario's Office of the Registrar General and found only a record of his father Bert's name-change to Gould in 1979 (to be able to legally marry with that name); he concludes that the family's name-change was informal and "Gould was still legally 'Glenn Herbert Gold' when he died." ^ According to Bazzana (2003, p. 24), "[Gould's] birth certificate gave his name as 'Gold, Glenn Herbert.' The family name had always been Gold [...] All of the documents through 1938 that survive among Gould's papers give his surname as 'Gold,' but beginning at least as early as June 1939, the family name was almost always printed 'Gould' in newspapers, programs, and other sources; the last confirmed publication of 'Gold' is in the program for a church supper and concert on 27 October 1940. The whole family adopted the new surname." ^ Full circumstances of the name-change can be found in Bazzana (2003, pp. 24–26). ^ According to Bazzana (2003, p. 27), "At least as far back as the mid-eighteenth century, there were no Jews in this particular Gold lineage." ^ Friedrich (1990, p. 27) dates this incident on the basis of a discussion with Gould's father, who is cited by Friedrich as stating that it occurred "when the boy was about ten". ^ ATCM is Associate, Toronto Conservatory of Music. The Conservatory received its royal charter in 1947 and became The Royal Conservatory of Music. ^ During Gould's 1957 concert performances in Moscow, Vladimir Ashkenazy labelled him a phenomenon (Till & Tovell 1985). ^ In their documentary film Glenn Gould: A Portrait (Till & Tovell 1985), Glenn Gould's father recalled that Glenn "would not come out [of his bedroom] until he memorized the whole music" [regarding one of Beethoven's piano concertos]. ^ In outtakes of the Goldberg Variations, Gould describes his practising technique by composing a drill on Variation 11, remarking that he is "still sloppy" and with his usual humour that "a little practising is in order." He is also heard practising other parts of the Goldbergs. ^ Gould: "The piano was a means to an end for him, and the end was to approach Beethoven." See Tovell (1959) 07:40 minutes in. ^ Friedrich first states that Gould performed the Beethoven Piano Sonata No. 30 (Opus 109) Friedrich (1990, p. 108) but later states that he performed the Beethoven Piano Sonata No. 31 (Opus 110) Friedrich (1990, p. 354). Bazzana (2003, p. 229) cites Beethoven Piano Sonata No. 30 (Opus 109). ^ Originally published in Piano Quarterly in 1974. Reprinted and quoted in Kingwell (2009, p. 159) and Kieser (1993). See Album details at world catalogue. ^ Bazzana (2003, pp. 352–368) In a section, quotes Gould: "They say I'm a hypochondriac, and, of course, I am." ^ Ostwald (1997, p. 329) specifies "No physical abnormalities were found in the kidneys, prostate, bones, joints, muscles, or other parts of the body that Glenn so often had complained about." ^ This is discussed and can be seen in the 1959 National Film Board of Canada documentary film On and Off the Record (Koenig & Kroitor 2004). ^ The claim that Gould "never shook hands" is exaggerated. Friedrich (1990, p. 267) quotes Timothy Findley: "Everybody said you never touched his hands, you never try to shake hands with him, but the first thing he did to me was to offer to shake hands. He offered me his hand in a very definite way, none of this tentative, 'don't-touch-me' stuff." ^ These include his famous "self-interview", his book review of a biography written about him (in which he refers to himself in the third person)—not to mention the various appearances of his "alter egos" in print, radio, or TV, including an "extended and rather strained radio joke show", ("Critics Callout Corner" on the Silver Jubilee Album, 1980) which Kingwell (2009, p. 180) comments: "The humour is punishing... There can be no excuse for it, and the one clear lesson of the recording is that it could exist only because of the stature of its creator. Gould in effect called in twenty-five years of chits from Columbia when he got them to release this embarrassing piece of twaddle." ^ These comments can be found in essays in Gould (1987). ^ There are two other Gould recordings of the Goldberg Variations. One is a live recording from 1954 CBC Records (PSCD 2007); the other is live recorded in Moscow on 7 May 1957 and in Salzburg on 25 August 1959 (Sony SRCR 9500). It is part of The Glenn Gould edition and has been re-released on CD on Sony Classical Records (SMK 52685). ^ Gould discusses this in the 1974 Bruno Monsaingeon film series Chemins de la Musique (Ways of the Music). His 24 part series features Gould in four of those parts: La Retraite (The Retreat), L'Alchimiste (The Alchemist), 1974, Partita No. 6 (Bach's Partia No 6). The four parts on Gould were re-released in 2002 on DVD as Gould: the alchemist (Monsaingeon 2002). ^ The Schubert can be seen briefly in the film Hereafter (Monsaingeon 2006). The transcription of Bruckner's 8th symphony Gould alludes to in an article (Gould 1987) where he deprecates its "sheer ledger-line unplayability"; the Strauss opera playing can be seen in one of the Humphrey Burton conversations and is referred to by almost everyone who saw him play in private. Cite error: A list-defined reference named "fnR" is not used in the content (see the help page). ^ Jorgensen, Birgitte (2003). 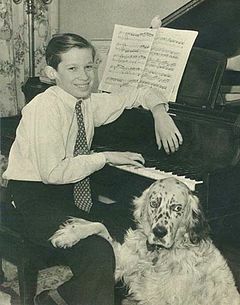 "The Dogs of Pianist Glenn Gould: In the Key of Woof". Modern Dog. Retrieved 24 December 2011. ^ a b c d e Tovell, Vincent (4 December 1959). Gould in conversation with his friend Vincent Tovell (excerpt): A 26-year-old Gould talks about his fame (CBC Radio. Radio Show: Project '60). CBC Radio 1. Retrieved 25 December 2011. ^ a b Bazzana, Kevin; Beckwith, John & Payzant, Geoffrey (4 March 2015). "Glenn Gould". The Canadian Encyclopedia (online ed.). Historica Canada. ^ Beckwith, John (15 September 2014). "Alberto Guerrero". The Canadian Encyclopedia (online ed.). Historica Canada. ^ a b c "Glenn Gould". soundbug.com. Misja.com. Retrieved 25 December 2011. ^ Host: Gordon Burwash (23 June 1957). "Glenn Gould is a rising star " The Story". CBC Newsmagazine. Canadian Broadcasting Corporation. CBC Television. . Retrieved 25 December 2011. ^ "Glenn Gould, biography". sonymasterworks.com. Sony BMG Masterworks. Archived from the original on 10 February 2008. Retrieved 12 March 2009. ^ Ostwald, Peter (1997). Glenn Gould: The Ecstasy and Tragedy of Genius. New York: W. W. Norton & Company. p. 47. Retrieved 1 February 2017. ^ "Glenn Gould Chronology". Library and Archives Canada. 25 September 2002. ^ Kelly, Kevin (22 March 1958). "Glenn Gould at Jordan Hall". The Boston Globe. The New York Times Company. ISSN 0743-1791. OCLC 66652431. ^ Glenn Gould's U.S. Television Debut – Bernstein conducts Bach's Keyboard Concerto No. 1 in D minor. 20 January 2016. Retrieved 5 February 2016 – via YouTube. ^ Announcer: James Fassett, Guest: Leonard Bernstein (25 April 1962). "Leonard Bernstein and Glenn Gould don't see eye to eye". CBC Radio Special. New York. CBC Radio. CBC Radio 1. . Retrieved 23 December 2011. ^ Schonberg, Harold C. (7 April 1962). "Music: Inner Voices of Glenn Gould; Pianist Plays Them in Addition to Brahms Bernstein Speech Hits at the Interpretation (article abstract)". The New York Times. Arthur Ochs Sulzberger, Jr. p. 17. ISSN 0362-4331. OCLC 1645522. Retrieved 23 December 2011. ^ "Musician's Medical Maladies". ahsl.arizona.edu. Arizona health sciences library. Archived from the original on 30 December 2007. Retrieved 12 March 2009. ^ Kingwell 2009, pp. 125–128 On "play" chapter 11. ^ Interviewer: Hugh Thomson (15 July 1958). "Glenn Gould: Variations on an Artist » Gould on his eccentricities » Did you know?". Assignment. Toronto. CBC Radio. CBC Radio 1. . Retrieved 12 March 2009. ^ Bruno, Monsaingeon (1983). "Introduction to The Last Puritan". collectionscanada.gc.ca. Ottawa: Library and Archives Canada. Retrieved 15 December 2011. ^ a b Clarkson, Michael (25 August 2007). "The secret life of Glenn Gould". Toronto Star. Torstar Corporation. OCLC 679765547. Retrieved 29 May 2009. ^ Hampson, Sarah (29 November 2009). "Christopher Foss grew up with Glenn Gould, but never got to say goodbye". The Globe and Mail. Retrieved 24 April 2018. ^ Burns, John F. (29 May 1988). "OTTAWA; An Exhibition of Glenn Gould Memorabilia Sheds A Little Light on A Musical Enigma". The New York Times. Arthur Ochs Sulzberger, Jr. ISSN 0362-4331. OCLC 1645522. Retrieved 18 December 2011. ^ Orr, Stephen (14 August 2013). "Being Glenn Gould - The Adelaide Review". The Adelaide Review. Retrieved 24 April 2018. ^ Dubin, Nick (2014). The Autism Spectrum and Depression. Jessica Kingsley Publishers. p. 77. ISBN 9780857002426. ^ Griwkowsky, Fish (15 February 2018). "Wildlife: On the trail of Count von Svoboda and Glenn Gould". Edmonton Journal. Retrieved 19 September 2018. ^ The Great Gould, Goddard, 2017, page 35. ^ "Glenn Gould's Steinway | The Canadian Encyclopedia". www.thecanadianencyclopedia.ca. Retrieved 29 March 2019. ^ Gould (1999, p. 205) Editor's introduction to the essay. ^ Gould, Glenn (1966). "The Prospects of Recording – Resources – The Glenn Gould Archive". collectionscanada.gc.ca. Ottawa: Library and Archives Canada. Retrieved 8 December 2010. ^ "The Variations of Glenn Gould: Legendary, Eccentric Pianist Launched His Career by Playing Bach". www.npr.org. National Public Radio. Archived from the original on 29 November 2011. Retrieved 24 December 2011. ^ Tommasini, Anthony (1 September 2002). "Two faces of a pianist who had many". The New York Times. 151. Arthur Ochs Sulzberger, Jr. p. AR20. ISSN 0362-4331. OCLC 1645522. Retrieved 22 December 2011. ^ "Variations on Gould". cbc.ca/radio2. CBC Radio 2. Retrieved 24 December 2011. ^ "Glenn Gould " The CBC Legacy " Timeline of a Musical Genius". cbc.ca/gould. Canadian Broadcasting Corporation. Archived from the original on 24 April 2013. Retrieved 25 December 2011. ^ Announcer: Ken Haslam, Commentator: Glenn Gould (11 December 1967). "Glenn Gould's fascination with Petula Clark (excerpt)". The Best of IDEAS. Toronto. 4:34 minutes in. CBC Radio. CBC Radio 1. . Retrieved 17 December 2011. ^ "Voyager – Music From Earth". voyager.jpl.nasa.gov. Jet Propulsion Laboratory. 20 August 1977. Retrieved 12 March 2009. ^ "Glenn Gould". The Canadian Music Hall of Fame. Retrieved 17 February 2018. ^ "Glenn Gould: The Sounds of Genius » Credits". civilization.ca. Canadian Museum of Civilization. 2007. Archived from the original on 14 November 2012. Retrieved 18 December 2011. ^ "Dr. José Antonio Abreu Awarded Coveted 2008 Glenn Gould Prize". newswire.ca (Press release). Aerial Communications Group. 14 February 2008. Retrieved 18 December 2011. ^ "The Glenn Gould School " Key Facts and History". learning.rcmusic.ca. Royal Conservatory of Music. 1997. Archived from the original on 26 April 2012. Retrieved 20 December 2011. ^ McCreery, Christopher (2005). The Order of Canada: Its Origins, History, and Development. University of Toronto Press. p. 210. ISBN 9780802039408. Retrieved 2 November 2018. ^ "Juno Awards Database". junoawards.ca. Canadian Academy of Recording Arts and Sciences. Archived from the original on 31 May 2012. Retrieved 18 December 2011. ^ "Home Past " Winners Search". www.grammy.org. National Academy of Recording Arts and Sciences. Retrieved 18 December 2011. ^ "Home " The Recording Academy " The GRAMMY Awards " GRAMMY Hall of Fame". www.grammy.org. National Academy of Recording Arts and Sciences. Retrieved 19 December 2011. ^ Patch, Nick (9 February 2013). "Late Toronto pianist Glenn Gould receives Grammy lifetime achievement award". Winnipeg Free Press. Archived from the original on 12 April 2013. Retrieved 11 February 2013. Bazzana, Kevin (2003). Wondrous Strange: The Life and Art of Glenn Gould. Toronto: McClelland & Stewart. ISBN 978-0-7710-1101-6. OCLC 52286240. Dubal, David (1985). The World of the Concert Pianist. London: Gollancz. ISBN 978-0-575-03654-3. OCLC 12112836. Eatock, Colin (2012). Remembering Glenn Gould: Twenty Interviews With People Who Knew Him. Newcastle, Ontario: Penumbra Press. ISBN 978-1-897323-20-5. Friedrich, Otto (1990) [Reprint. Originally published: New York: Random House, 1989]. Glenn Gould: A Life and Variations. New York: Random House. ISBN 978-0-679-73207-5. OCLC 21445409. Gould, Glenn (1987). Page, Tim (ed.). The Glenn Gould Reader. Boston: Faber and Faber. ISBN 0-571-14852-2. OCLC 751249764. — (1999). Roberts, John Peter Lee (ed.). The Art of Glenn Gould: Reflections of a Musical Genius. Contributing author Roberts. Toronto: Malcolm Lester Books. ISBN 978-1-894121-28-6. OCLC 45283402. Greenfield, Edward; Layton, Robert & March, Ivan (1988). The New Penguin Guide to Compact Discs and Cassettes. London: Penguin Books. ISBN 978-0-14-046829-8. OCLC 18804114. Hafner, Katie (2009). A Romance on Three Legs : Glenn Gould's Obsessive Quest for the Perfect Piano. Toronto: McClelland & Stewart. ISBN 978-0-7710-3762-7. OCLC 0771037627. Kingwell, Mark (2009). Extraordinary Canadians Glenn Gould. Toronto: Penguin Canada. ISBN 978-0-670-06850-0. OCLC 460273223. Ostwald, Peter F. (1997). Glenn Gould: The Ecstasy and Tragedy of Genius. New York: W. W. Norton & Company. ISBN 978-0-393-04077-7. OCLC 35586754. Payzant, Geoffrey (1978). Glenn Gould: Music & Mind. Toronto; London: Van Nostrand Reinhold. ISBN 0-442-29802-1. OCLC 16422990. Gould, Glenn (1992). The Glenn Gould Edition Richard Strauss: Ophelia-Lieder: Three Songs after Shakespeare, Op. 67; Enoch Arden: A Melodrama for Piano after Tennyson, Op.38; Piano Sonata, Op. 5; Five Piano Pieces, Op. 3 (Booklet). Glenn Gould & Claude Rains & Elisabeth Schwarzkopf. New York City: Sony Classical Records. ASIN B0000028O4. UPC 07464526572. Kieser, Karen (1993). Glenn Gould Bach: original CBC broadcasts (Booklet). Glenn Gould. Toronto: CBC Records. OCLC 609984589. UPC 059582220054. Lay summary. Koenig, Wolf & Kroitor, Roman (1959). Glenn Gould: Off the Record (Documentary film. Originally produced in 1959 for the television program Documentary '60). Montreal: National Film Board of Canada; Image Entertainment (Distributor). OCLC 130741039. UPC 014381206920. Retrieved 30 January 2013. Koenig, Wolf & Kroitor, Roman (1959). Glenn Gould: On the Record (Documentary film. Originally produced in 1959 for the television program Documentary '60). Montreal: National Film Board of Canada; Image Entertainment (Distributor). OCLC 130741039. UPC 014381206920. Retrieved 30 January 2013. Monsaingeon, Bruno (2002). Glenn Gould: the alchemist (DVD) (in English, French, German, and Spanish). ORTF; EMI Classics (Distributor). OCLC 52719241. UPC 724349012899. Retrieved 23 December 2011. Lay summary. — (2006) [2005 Original release]. Glenn Gould: Au delà du temps [Glenn Gould: hereafter] (DVD. Original release 2005) (in English, Italian, Russian, French, German, Spanish, and Japanese). Paris: Idéale Audience and Rhombus Media. OCLC 612160794. UPC 899132000206. Retrieved 23 December 2011. Lay summary. Stegemann, Michael (1993a). Bach: Partitas BWV 825–830; Preludes and Fugues (Booklet). Glenn Gould. Sony Classical Records. OCLC 222101706. SM2K 52597. — (1993b). The Glenn Gould Edition Gould Meets Menuhin: Bach·Beethoven·Schoenberg (Front cover booklet). Glenn Gould & Yehudi Menuhin; English translation: Stewart Spencer. Sony Classical Records. OCLC 30923019. UPC 5099705268827. That Menuhin ever agreed to tackle Schoenberg's Phantasy shows how much he admired Gould and how much he was prepared to learn from a man sixteen years younger than himself: "Well, Glenn, I was very anxious to take you up on the invitation to play it because I admire you. I know that you know more about Schoenberg, and have a more genuine understanding of Schoenberg perhaps than anyone else. And I'm always interested in learning about something through the eyes of someone who understands it and loves it." Whereas only a few months later, in January 1966, Gould's collaboration with Elisabeth Schwarzkopf turned into an outright fiasco, since the soprano was totally unprepared to accept any of Gould's interpretational idiosyncrasies, Menuhin was ready to embrace the new perspectives opened up by an unorthodox view even in the case of a work like Beethoven's Opus 96 Sonata, which of course he knew better than Gould. "I admire this [i.e., the way you play], and I wish Beethoven were here to hear you, because the way you do it is absolutely convincing, as I feel. I don't have quite the courage to go against the printed text or the indication in the score, which is simply pianissimo. But there again, everything is a relative factor." Till, Eric (Producer / Director / Narrator) & Tovell, Vincent (Producer / Director / Narrator) (1985) [First published as Documentary film in 1985]. Evans, Wayne (ed.). Glenn Gould: A Portrait (VHS Videotape released 22 October 1991). West Long Branch: CBC Enterprises; Kultur International Films (Distributor). OCLC 22897163. UPC 032031118836. Retrieved 23 December 2011. Lay summary. Cott, Jonathan (2005). Conversations with Glenn Gould. University of Chicago Press. ISBN 0-226-11623-9. OCLC 475021622. Konieczny, Vladimir (2008). Glenn Gould: a musical force. Toronto: Dundurn Press. ISBN 978-1-55002-819-5. OCLC 471481579. Mantere, Juha Markus (2012). The Gould Variations: Technology, Philosophy and Criticism in Glenn Gould’s Musical Thought and Practice. Europäische Hochschulschriften. Reihe XXXVI, Bd. 266. Frankfurt am Main: Peter Lang. ISBN 978-3-631-62279-7. ISSN 0721-3611. Pagliari, Matteo (2012). Invenzione a due voci. Una conversazione con Glenn Gould (in Italian). Bologna: Albisani Editore. ISBN 978-88-95803-16-6. Glenn Gould 1988: [printed explanatory text for] a Travelling Exhibition Prepared by the National Library of Canada and Touring with the Assistance of the International Programme of the Department of Communications. Ottawa, Ont. : National Library of Canada, 1988. N.B. : Texts in English and in French in parallel columns. Wikimedia Commons has media related to Glenn Gould. "Glenn Gould collected news and commentary". The New York Times.